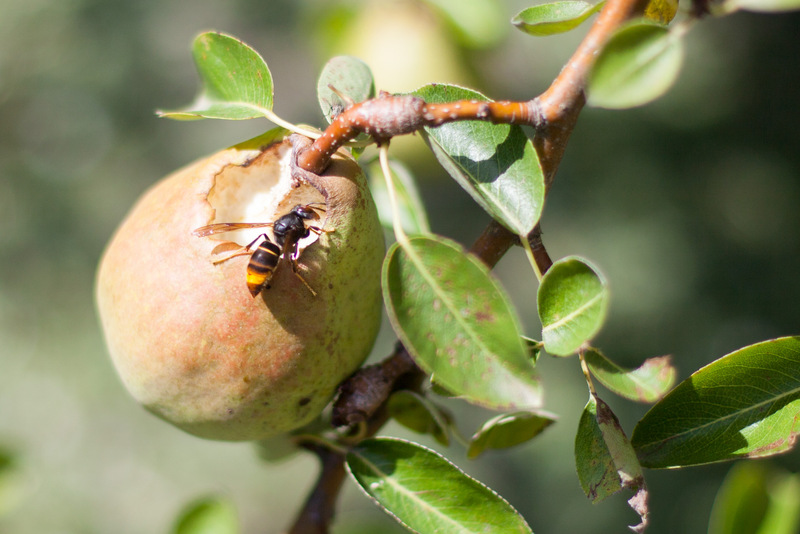 In September I attempted to stop hornets from eating our pears… with pebbles. The improvised solution worked rather well, without damaging the pears. Photo 28 August, Saint-Simon, France. Same tree and a hornet on one the first pears to be damaged. Photo 29 August. What could we do? 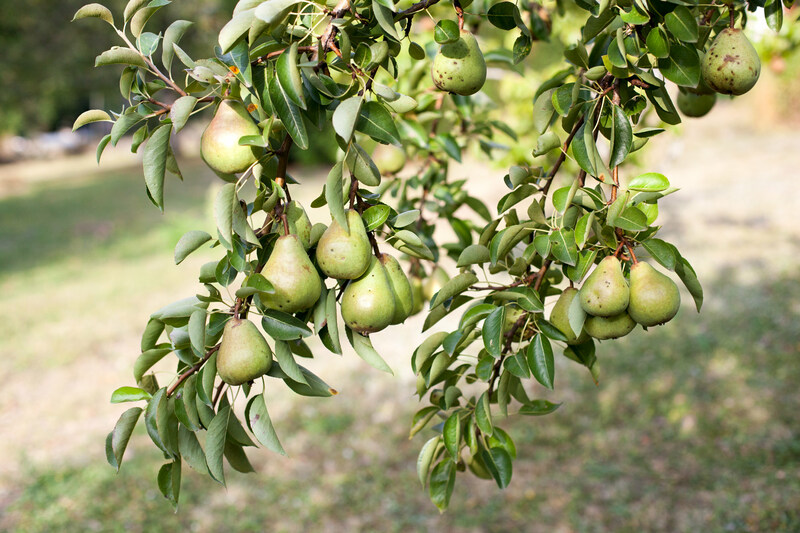 Pick the pears for them to ripen in the barn? I wanted to leave them on the tree for as long as possible so that I could learn more about the best time to harvest. Kill the hornets? Yes, I killed some with a fly swatter. But even if there were not that many, just one of them once in a while, it would have required to be around the tree too often. I noticed that the hornets were coming back to the pears they had already dented. What if I found a way to close the holes? I used small pebbles of various sizes and shapes from the alley next to the tree, some of them hardly bigger than coarse sand. I would take a handful and try until I found one that fitted in. 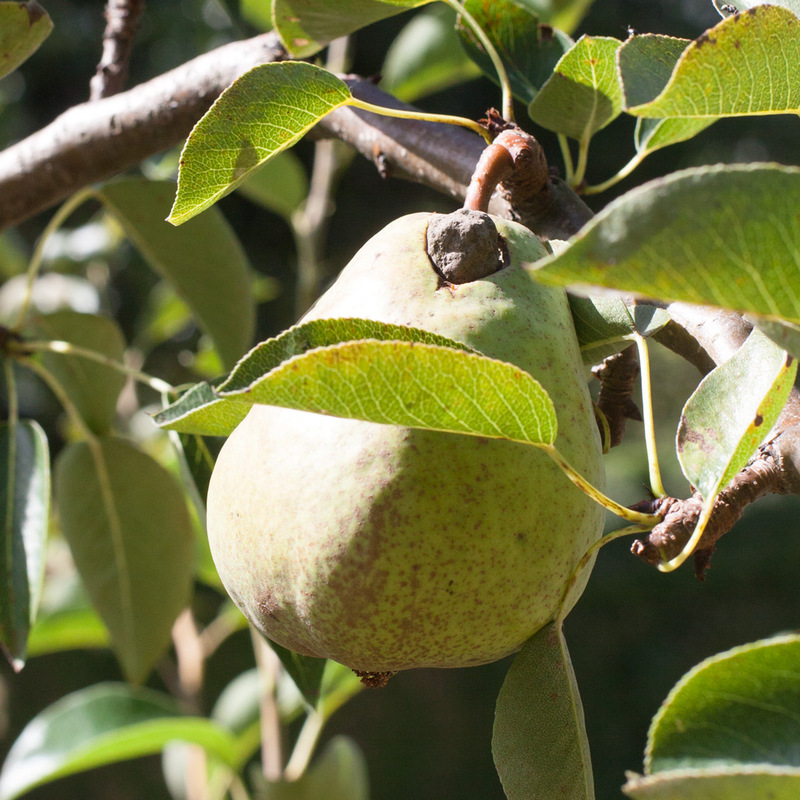 It was not that difficult and I repeated the operation on about twenty pears during the first fortnight of September. Pebble closing the hole created by a hornet. Photo 3 September. It worked. In most cases, the pebbles remained in their hole and the hornets didn’t come back. Because of the pebbles? Because of human odour left on the pears? I don’t know. But it worked. In the end, we ate more ripened-on-the-tree pears than we would have otherwise thanks to this somewhat unorthodox improvised solution. 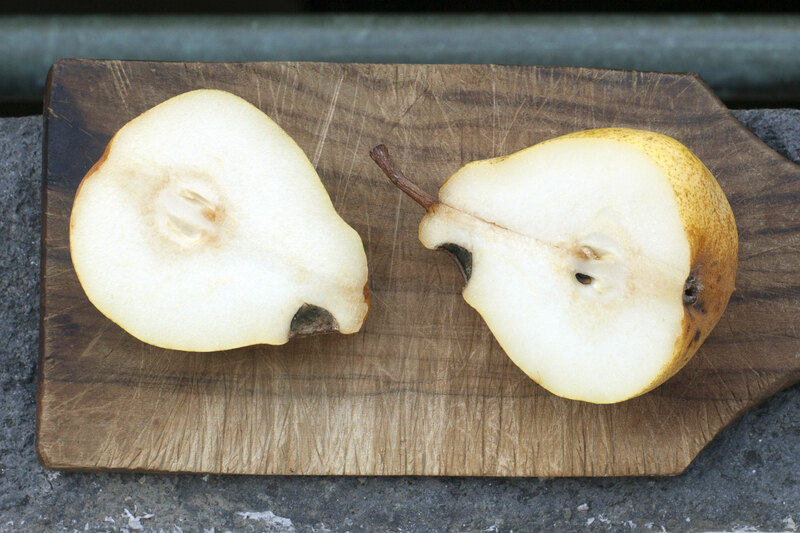 Pear saved from the hornets, harvested on 13 September, now ready to eat. Photo 23 September. The scar had well healed. Photo 23 September. I checked the tree almost everyday from the end of August, sometimes several times per day, when the hornets started to attack. I wanted to observe the ripening process. 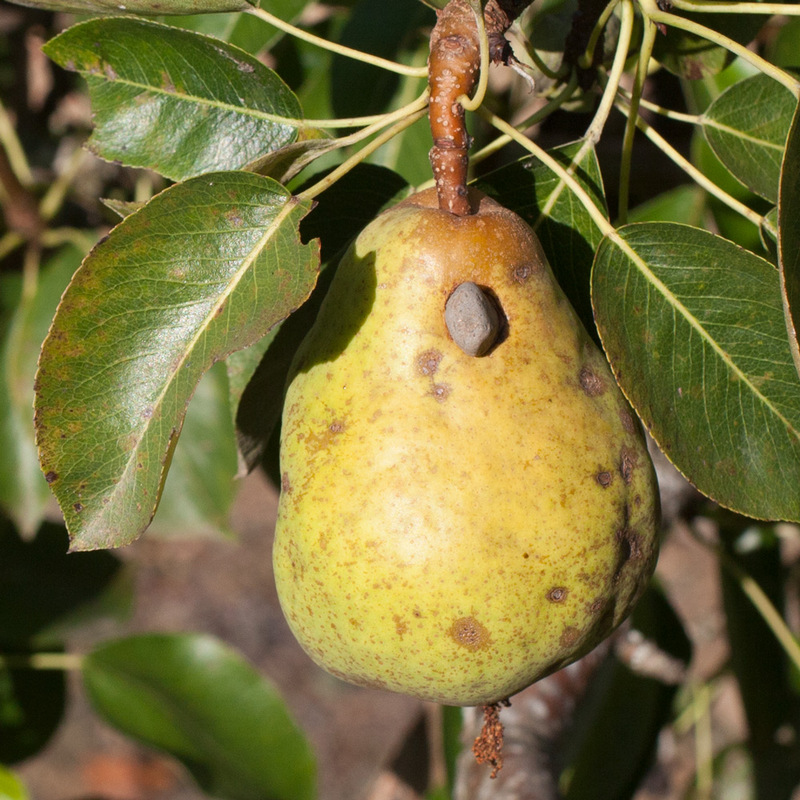 To what extent would the pears turn yellow? Would they benefit from being exposed to the sunshine a few more days? Would they continue to grow? Become sweeter? When would be the best time to harvest them? Would they all ripen at the same time? 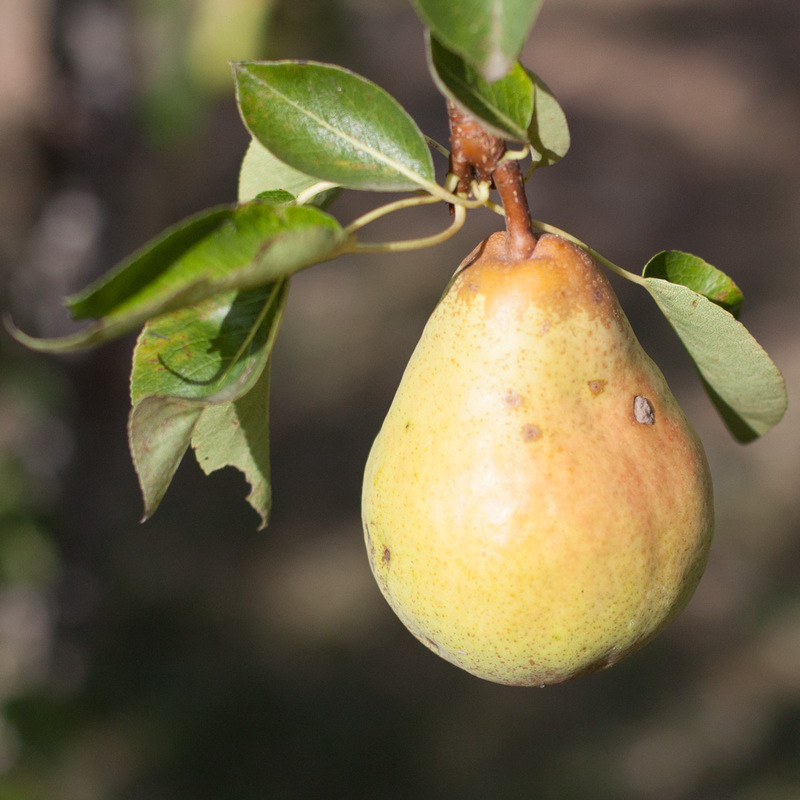 The last question was the easiest to answer: at least a week passed between the first and the last pears to become yellowish. They didn’t become fully yellow on the tree. They would fall before, and in any case we decided to harvest them before a storm, on 13 September. 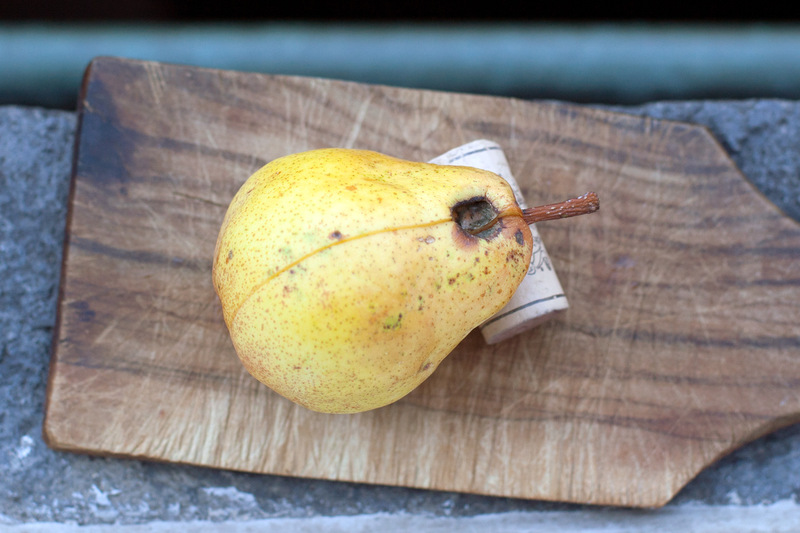 We then waited for a few days for the pears to be ready to eat. Continue to grow? The last pictures in this post suggest a positive answer, although it is not easy to judge from the images. Sweeter? It is hard to say. The pears we ate were sweet and tasty. Next year, I could pick some of them early and try to get them ripe at the same time as those ripened on the tree. We could then taste both and compare. Or use a refractometer to measure sugar content, which I don’t have at the moment. Best time to harvest? On a dry day. We did that. But then? I learnt from “Les Croqueurs de Pommes du Cantal” that fruit picked when ripe kept better because of higher sugar content. Yet I also read that professional fruit growers say fruit should be harvested a bit earlier for better flavour. Who’s right? Both of them? I couldn’t figure out myself. If this tree produces again next year, I will have another opportunity to find out. 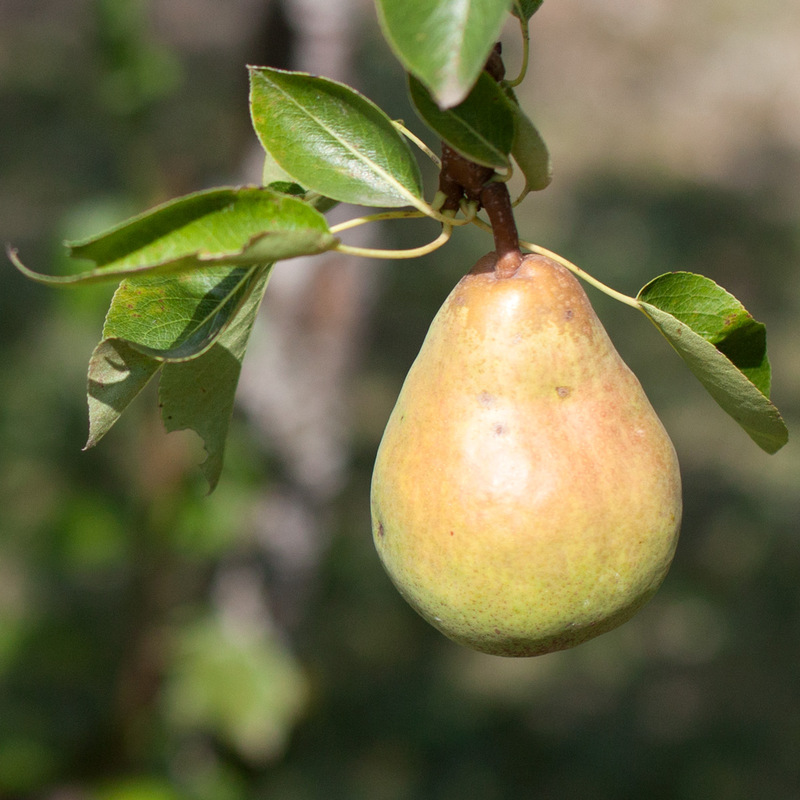 Overall, these four weeks of observation enabled me to start and build knowledge about pear ripening on the tree. I also enjoyed the experience of daily visits to trees bearing fruit. The hornets were not that much of an inconvenience. 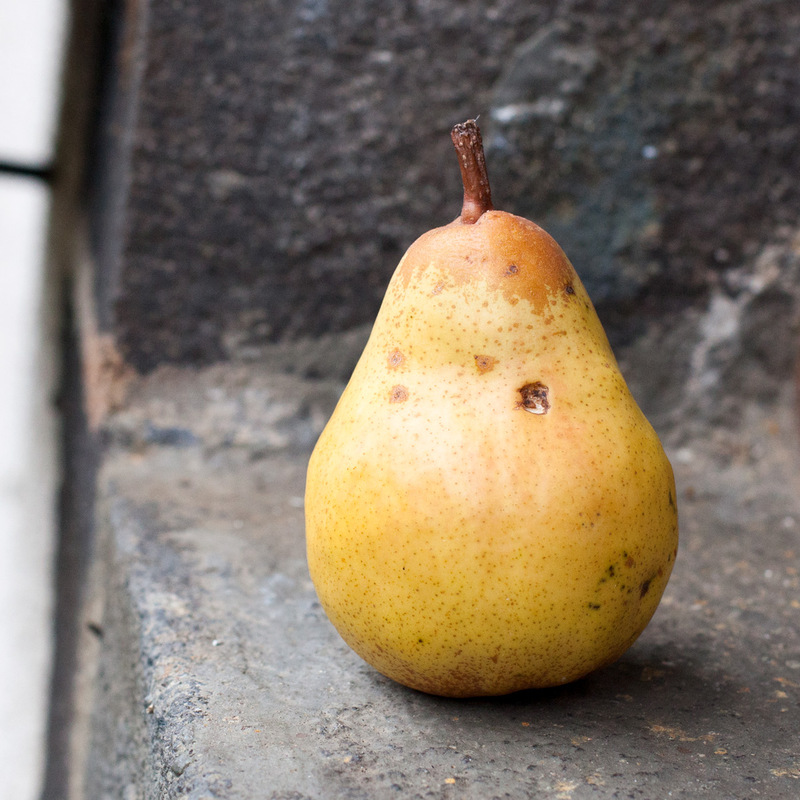 One of our nicest pears. Photo 28 August. The same pear on 9 September, with a small pebble I fitted (click on image to enlarge). Ready to eat, five days after picking. Photo 18 September. 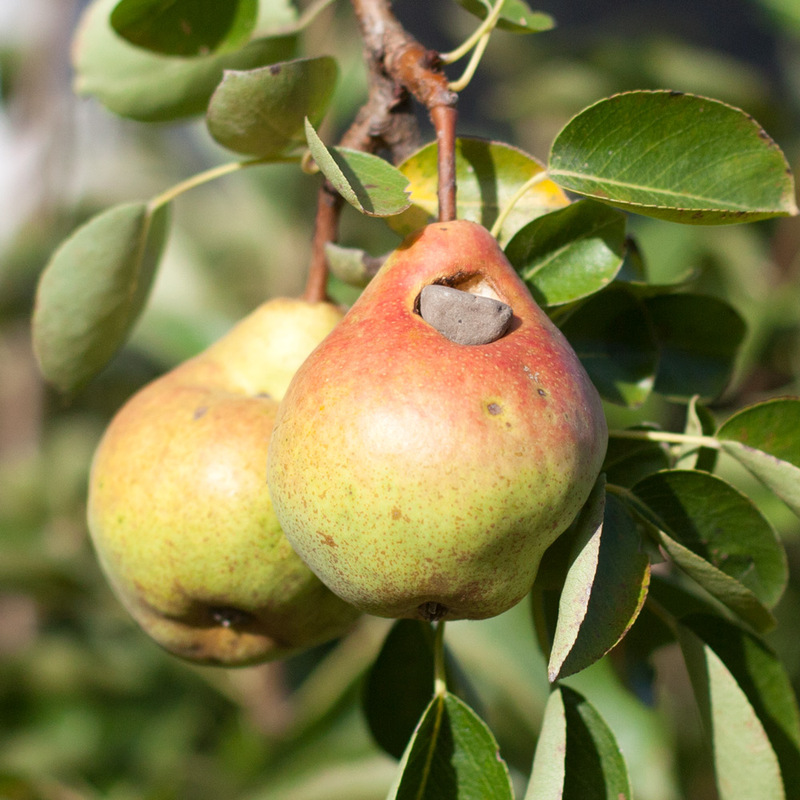 This entry was posted in Grow and tagged France, Pears, Saint-Simon by Les Jardins d'ici. Bookmark the permalink.